What if di Vinci had internet? So I posted this as part of my work. What do you think the art world would be like if artists like di Vinci, Van Gogh, Dali, Rembrandt and Picasso had internet? Would it change their art, how they look at the world, what they created, or even how they created their art? The purpose of the project is to bring communities and people together to work on improving their neighborhoods and learning to solve problems together through art. Though we all have some kind of creative side it is often difficult to see how people’s ideas and styles can work together to form a larger image. In this day of digital age it is easy to forget that the teaching of problem solving using your mind and not a computer is still an important process for the development of students and artists as a whole. The Art Puzzle Art Project is meant to give children and adults alike the ability to learn new creative ideas and how they can be related to problem solving while creating group and community based art. 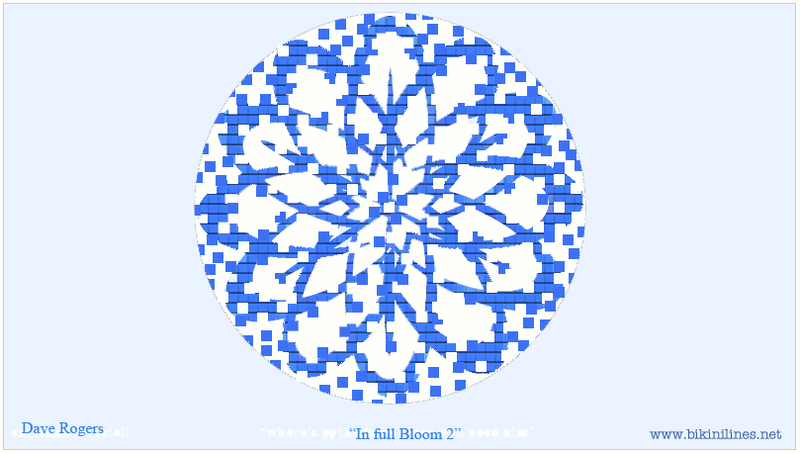 Each puzzle will contain 3-4 images in which the groups can work on to create a final image. Working from an image provided to them and with various artists and those interested in art each person will either paint, draw or design their piece of the puzzle without knowing where the piece will fit into the puzzle or which pieces will be next to theirs. 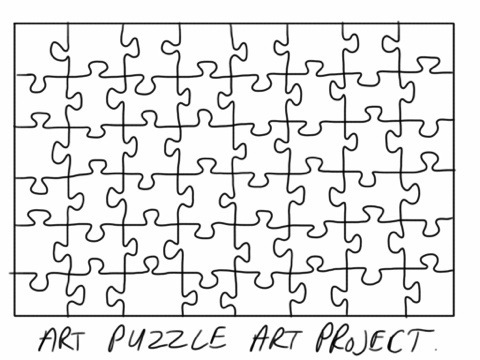 Once each piece is completed the puzzle will be put together by the group to make a final image. The puzzel can be designed to not only teach problem solving but as a tool for learning topics and design concepts as well, but even more, the Art Puzzle Project is ideal for teaching children and adults about diversity and how though we are all different we can still go together. While each person designs their own piece in their own way, in th end they go together to form a single work of art. The total cost of the project will be (amount to be determined later). Which will cover the cost of design and cutting of the wood, materials for the perticipatants to create their part of the puzzle, and various artists to help with the project. Compensation per artist assisting in the event: 100 USD total of 5 artists. Now that I have talked about my influences on the design of my work. There was a definite influence from my time in Asia and my time in the military in this design. The original design as the combination of a Japanese style flower, both in design and colors, and the Atomic bomb. 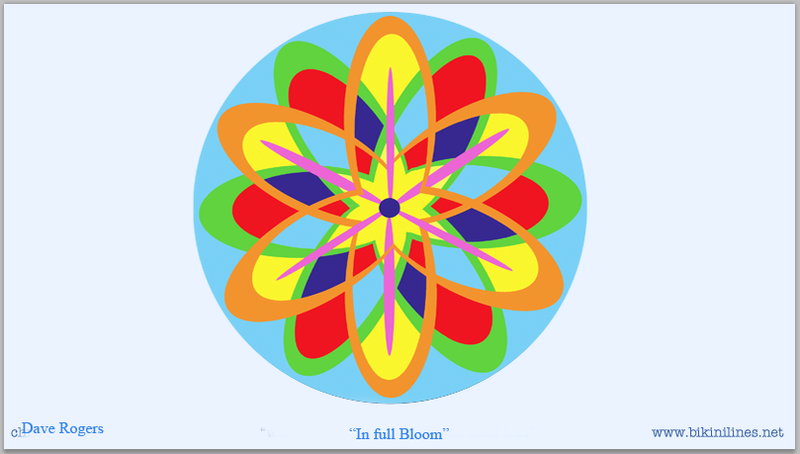 I wanted to design the flower as if it was exploding out on the cactus dome… with the idea that it could also retract. 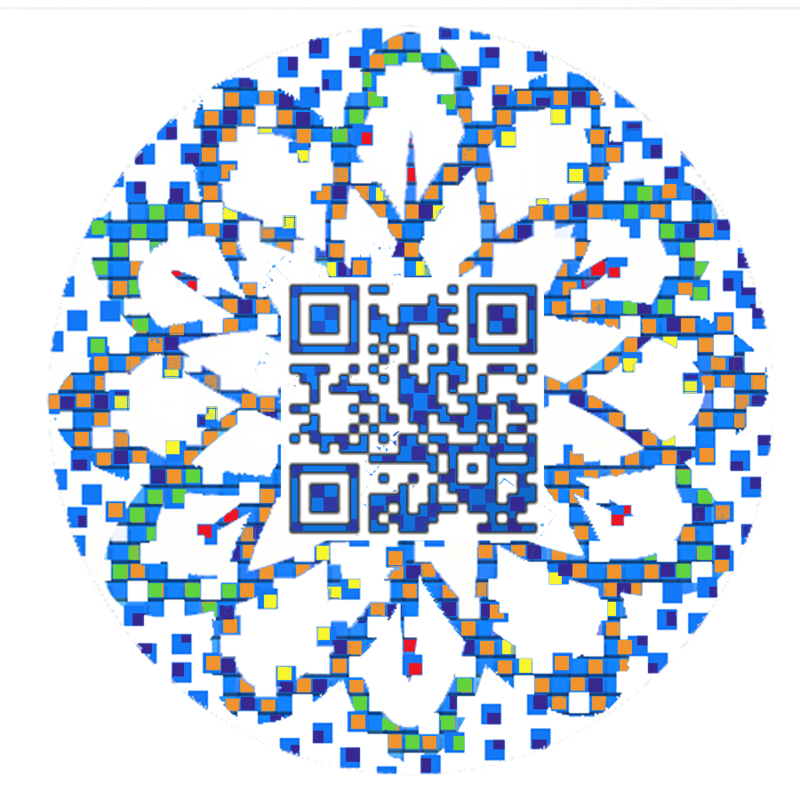 Than with suggestions from Christian I thought about adding the QR code. At first it did not seem to fit in with just a blue background, but I want to make this happen, so I started playing with the color, and thought, why not keep the original colors in the new design. If chosen this may not be the exact way that it looks, it may need to be adjusted due to the structure of the dome, but it will be close to this.. Though there is no guarantee that I am going to win this project, I am glad to be able to share my ideas of this project as I feel it really fits with the concepts of the overall project. I am enjoying working on this project, and look forward to it coming to completion and that I am able to help make that happen. If you like my concept and my design I hope that you go to the flicker link and vote for me. Now that I have explained how my military experience has influenced my art, it would be good to talk about my introduction to paper cutting and how it influenced my painting. I first discovered (I say discovered like I found a new country, but I mean it in the personal sense) paper cutting on a visit to China in 2004. I was there as part of a exchange program, when I went back to school for my degree in art. While there we visited the city of Foshan, where there was a school of paper cutting. I immediately saw the possibility of making this part of my art. After I moved to China I started visiting the school observing the technique for paper cutting and practicing at home. This gave me a greater sense of my idea for my paintings. I started working on my paintings as a style of my paper cutting and my style of paint by numbers, a POP stye of work I started during that time. I formed the paintings as painting lines in a Chinese line painting, laying the canvas down and painting the lines. I would than put an underline color on the canvas of blue that would help the other colors stand out. Using a dead pallet and the color orange I would fill in the spaces with paint just like a color by numbers. The designs in the the water and sometimes in the background is something that I picked up from visits to rural areas of China, Korea, and Japan. Similar designs were painted on cloth by minority groups in China. I felt that the designs fit well with the ideas of mixing contemporary and traditional forms of art, and it gave me an area to express my ideas about thoughts behind the paintings. In the first post I gave a general explanation on why I got involved with the Cactus Dome project. Here I would like to give a little further detail explanation on my work and how it fits with the project. As I stated the ideas started after I left the military and started getting back into art. As a soldier I saw many things that not only influenced my art but my life in general. One thing that I came to realize during my time in the military is how fragile life is. While we all know that we can die at any time, seeing death and disaster gives you a different perspective on life. The biggest influence of this was my time at the World Trade Center. During the first two days I worked as security at the entrance for the on site morgue. We watched as people walked past us with body parts in buckets and bags on their way from the lines to the morgue. On the second and third day I was asked to work on the bucket brigade itself. We start at the rear of the line, passing in empty buckets and and passing out buckets full of rubble. When the person at the front of the line finds something they either bag it or put it in a bucket and take it to the morgue, making the person in the second place to move forward to the digger. When it came to my turn I found something that became stamped in my mind, what appeared to be a small hand. After turning it in I went back to the line to pass the buckets. What I found interesting about the line is that there I was standing between FBI, ATF, FEMA, and other government agents and civilians, none of them talking about who was in charge but simply doing their part in the recovery. Just when we started to get a good rhythm going there was a rumble and scream, looking over we could see the front of Tower 7 coming down. As people started to run out, my military training kicked in and I started directing them instead of running. As people ran past someone knocked me over causing me to hurt my neck and back. After a short hospital stay I was back at the World Trade Center giving out supplies to units and organization down there and filling in where needed. The pain continued in my neck and back as my C5 was twisted and stuck. At the end of Oct. the unit was deployed to West Point Military Academy where we served as part of Home Land Security for Operation Enduring Freedom. While there I continued to have pain in the neck and back, than one day I woke up and had no feeling in the left side of my body and could not move my neck. I was transported to Walter Reed Medical Center where I had a discectomy between C5 and C6. While I felt better I continued to have problems and could not do certain things. in 2003 when my unit was getting ready to deploy to Iraq the military doctor at the readiness center declared me unfit for deployment and stamped my paper work. When you are unfit for deployment the army lets you go. So just like that 14 years of service was over, I was out of the military trying to start my new life. Not sure in what direction I wanted to go. Many people have asked me why I have gotten involved with Bikini Lines. The answer was simple, not only does the project fit with the kind of work I am doing but it is also a great chance to be part of something that will be placed in history. From the time that I left the Army my work has been about time and the fragility of life. I started my new work after a trip to China where I discovered the ancient art of paper cutting. I started making connections between this, my own style of art and my time in the military. As an artist I have also believed in doing work that not only speaks to people, but helps them as well. Many of the projects I have been involved with have been fundraisers and public works to improve the visual aspects of an area, or to reach people in a new way. This project has all the concepts of a public work that hit home for me. Bikini Lines is a project to paint the world’s largest painting on the cactus dome in the Marshal Islands. More than being part of the world’s largest painting, it is exciting to be part of something that is going to help the orphans of the disaster in Japan in 2011. I am including links to Bikini Lines for those who would like to get involved and also samples of my work for the Bikini Lines. This is a video I put together for how my art would look being placed on the dome from above… Am really enjoying working on this project, and hoping to be there to help make this happen. I said it before and I’ll say it again, projects like this don’t come along often, when they do you have to reach out for them, especially when they are projects as great as this one.. Probably one of the most important movements in art, the enlightenment encompasses some of the greatest changes not just in art but how we view art and society as a whole. As we explore the ideas of the enlightenment and the art of the time we will find parallels as well as distinctions in philosophical ideas of the time and the work being produced. These similarities and distinctions are formed due to social, political and religious thinking of the times and areas surrounding the artists and their own personal beliefs and understandings of the subject of enlightenment. While the ideas of the enlightenment stretch from the end of the Middle Ages to the 19th century, it is not until the middle of the 18th century that we start to see these ideas even take shape. And while they seem to come together in the 19th century the ideas of the enlightenment will not during this time or even our time be fully realized in society as much as it is in art. I will attempt to explore the aspects of art and its connection with the enlightenment from the “taste of nature” to the enlightenment in America. The four areas of focus will be the Late Baroque/Rococo period in Great Britain, Scotland, Central Europe, and America. In particular examining the works of William Hograth (1697-1764), Marriage a la Mode, 1743, Henry Raeburn (1756-1823), Rev. Robert Walker Skating, 1790s, The Asam Brothers, Egid Quirin (1692-1750) and Cosmas Damian (1686-1793) Weitenberg Abby Church, and Charles Willson Peale (1741-1827), George Washington at Princeton, 1779 and how their works relates to the enlightenment ideas. Before we can examine if the ideas of the enlightenment connection with the art of the time it is important to understand what we are talking about, in other word what are the enlightenment ideas? There are seven main ideas of the enlightenment; human autonomy, the importance of reason, that enlightenment is universal, progress, secularism, the centrality of economics to politics, and the idea of popular government (Olson). They can be broken into three areas; the idea of the individual as independent thinker, the separation of Church and State, and the ability for people to govern themselves. These ideas while separate depend on each other to exist. The idea of the individual artist as an independent thinker started with the introduction of the art market in Holland, but did not start to be understood until the forming of Academy of Art in France. Unlike the early part of the Baroque period artists in the late Baroque/Rococo period show more freedom of individual thought and style in their works. This comes in part to the introduction of the Academy but is also related to the growth of the middle class in the late Baroque period. This growth allowed more people to buy art and show their likes and dislikes in the collection of art during the period. It is through this growth that artists were able to explore more independent styles and ideas in their works. We see examples of this in the works of Hograth, Raeburn, Peale styles during the time. More so in the works of Hograth and Peale who while learning from the styles of earlier artists showed more individual styles in their work than that of Raeburn whose Dutch influence is shown in his work Rev. Robert Walker Skating, 1790s, and the Asam brothers who showed great influence by Bernini in their works. Hograth who did genre-like paintings of the time did his work with commentaries on the social status of the people in Great Britain, while Peale and other artists of the American Enlightenment created works with a more realistic style and even though Raeburn’s Dutch influence could be seen in his work, his portraits took on the more natural form of paintings of the enlightenment than those of the Dutch Masters that influenced him. This is not to say that artists of this time were totally independent in their thinking. As in the example I gave of Rev. Robert Walker Skating, 1790s much of these artists works were influenced by the great artists of earlier styles and techniques of Europe especially that of Italy and Dutch areas. This was due in part to the liking and wants of the art market which is influenced by peoples understanding of what art should be. Though the works were not controlled by a Monarch they were greatly influenced by the art market and desires of society as a whole. So while they had greater freedom in expressing their ideas, the artists would change from becoming slaves to the idea of one individual or the demands of the church to the ideals of the desires of social needs and wants. This concept would not just take hold in the ideas of the Individual but also through the idea of the separation of Church and State. The idea of separation of Church and State, while an idea of the enlightenment would not be fully understood or even achieved during that time or even in today’s society. Though the late Baroque period of art would see the less control of the Church over the government, there would still be influences of the Church in Europe and America during the end of the enlightenment. Part of this freedom came from the philosophical questions about God and the role of the Church in society and the government. It would also be influenced with the introduction of the Academies which would teach about individual ideas and concepts of the time as well as introduce science and new ways of thinking. As we examine the works of Hograth, Raeburn, Peale we can see a clear separation from the earlier influences of the Church in works of art. These artists’ works would reflect life as they saw it and not as moral or even spiritual guides or stories being laid out. Hograth’s Marriage a la Mode, 1743 while focused on the idea of a wedding would be more about the ups and downs of life than hold any kind of religious symbols or works that we would see in other marriage portraits of the earlier Baroque. Peale’s George Washington at Princeton, 1779 would be like most of the works of the time, historical in nature, and not like some earlier Baroque works that would add religious meaning or symbols to portraits of leaders of the time. Even Raeburn’s portrait of Rev. Robert Walker Skating, 1790s would show the Reverend not giving a lecture or preaching to people, but simply enjoying one of life’s simple pleasures. But this is not to say that the Church did not have some influence on art or even society during the time. While most artists were looking to create their own styles of work, artists like the Asam brothers were greatly influenced by the works of such artists as Bernini and others who would create great masterpieces in the name of the reformation. Their work on the Weitenberg Abby Church showed not just a liking to Bernini but also a following of his ideas in creating works that not only spoke of the Church’s role in Central Europe but also designed as a stage to draw people in. The root idea of the enlightenment’s separation of Church and State coincides with the idea of a popular government system not ruled by a Monarch. Though the idea of the artists working as an individual and not strictly for a monarch started with the art market in Holland and continued with the formation of the Academy of Art in France, it would have a greater acknowledgement in Great Britain and America during the enlightenment. Artists of these areas would have more freedom to create art that fit more to the liking of the people than that of a Monarch. This was due in part to Great Britain forming of a Parliament in the early 1700’s and America’s introduction of a government designed for and by the people. We would see less of this idea in Central Europe areas like Germany not so much because of the form of government but more due to the late arrival of Central Europe in the enlightenment due to the 30 year war. So while the works of the Asam Brothers seems more like earlier Baroque art that was influenced by the Church and controlled by the Monarch there is little evidence that this was the case in those areas in Europe. Hograth’s work which was more of a commentary on the sad state of the élite was a clear sign of artists moving away from the desire to impress the Monarch. And though Raeburn and Peale had both done portraits of prominent leaders and rulers during the time, their works were more of homage to those people than those of the earlier works in the Baroque who sought to seek favor with the Monarch. As we examine the ideas of the enlightenment of the period with art, we can see that there are many parallels and a conflict in the ideas of the enlightenment and how they relate to the art of the time. The idea of separation of Church and State and the diminishing control of the government over artists and the art during the time were successful during the enlightenment. It is in the idea of the artist as a complete individual seems to simply change hands and not exist completely in the idea of enlightenment in art. While artists were free to explore more ideas in their arts, and they were not subject to the control or wants of the Church or Monarch, they did become workers to the ideals and desires of the market of the times, whether it was the growing middle class, the more sociable and influential upper class or the taste of museums and galleries artists would continue to work for the desires of others in their art.